CAAP supports the Food Security Coalition and numerous anti-hunger organizations by formally supporting a budget recommendation of $21 Million for the State Food Purchase Program and $5 Million for the Pennsylvania Agricultural Surplus System in the State FY 2017-18 budget. Food insecurity is still experienced by far too many of our fellow Pennsylvanians with nearly three million residents turning to food pantries and other food assistance programs to feed themselves and their families. Last year, you and the General Assembly provided a 4.1 percent increase for the State Food Purchase Program. Even with this increase, funding for this vital program is still below the 2006-2007 level. While the increase was good news, millions of working families, children, and seniors still lack access to healthy, nutritious meals. We believe that the relatively modest investments of Commonwealth resources requested will yield great benefits for Pennsylvanians struggling with hunger. Thank you for your consideration of our request and for your commitment to ending hunger in Pennsylvania. We look forward to working with you to make certain that the Commonwealth’s next budget moves us closer to that goal. On September 21st, the Wolf Administration unveiled its food security plan – Setting the Table: A Blueprint for a Hunger-free PA, and announced the receipt of a federal grant aimed at addressing hunger in young children up to age 5. On September 29, 2015, Governor Tom Wolf signed an executive order establishing the Governor’s Food Security Partnership (Partnership). The Partnership is comprised of the secretaries of the departments of Aging, Agriculture, Community and Economic Development, Education, Health, and Human Services. It is responsible for promoting coordination, communication, and joint planning between government programs and entities in the private sector in providing nutrition and food assistance to Pennsylvanians. • Every county and/or region in Pennsylvania will have a local food alliance to combat hunger in their local communities. • The SNAP participation rate will increase from 90 percent to 98 percent or higher. • The number of children benefiting from free and reduced price meals during the school year (linked to nutrition programs in summer) will increase from 20 percent to 30 percent. • Sixty percent of students benefiting from free and reduced priced school meals will participate in school breakfast. This is an increase from 47 percent in 2014-15. • The Women, Infants, and Children (WIC) Farmers’ Market Nutrition Program redemption rate will increase from 308,000 to 340,000 checks annually. • Double SNAP Bucks will be available at all highly accessible, high-need farmers’ markets, and additional SNAP recipients will have access to SNAP employment and training and SNAP education. 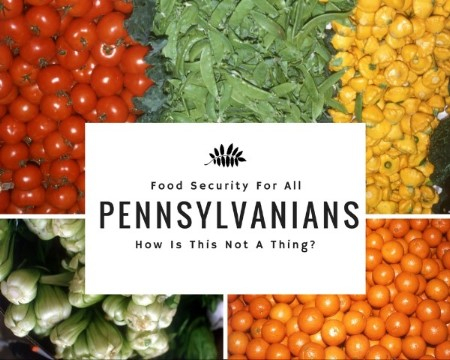 • Pennsylvanians will have streamlined access to food security information and benefits. • The average number of people participating in WIC programs will increase from over 245,000 to 260,000. • Pennsylvania will improve access to healthy, nutritious food. The U.S. Department of Agriculture’s (USDA) Food and Nutrition Service awarded $500,000 to Pennsylvania to help improve retention of children in the Special Supplemental Nutrition Program for Women, Infants and Children (WIC). These funds will enable the Pennsylvania Department of Health to better fulfill its crucial role in ensuring young children up to age five have a foundation for nutritional success. CAAP and the PA Food Security Coalition have played a proactive role in the development and support of the Blueprint’s goals and will continue these efforts in 2017.